If you are looking to replace missing teeth, dental implants are your best solution. Dental implants are a permanent solution which consists of a new crown that is typically made of porcelain fused metal (PFM) and a new root made of titanium. Connecting the new crown to the new surgically implanted root is an abutment which is an adjustable connector. Dental implants are quickly becoming a standard solution in comparison to dentures, bridges, and crowns, as they are a more favorable, long-term solution for many patients. Implants are very easy to take care of and can last a lifetime with proper care. 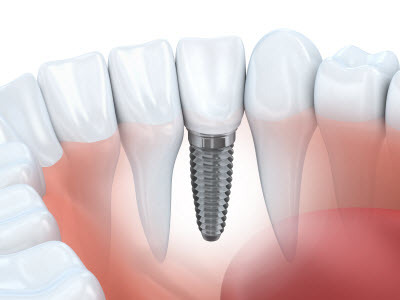 The Implant – This component is constructed out of titanium and serves as a new root for your tooth. It is surgically placed into your jawbone and becomes integrated into your bone over time through a natural process called osseointegration. The Abutment – This component serves as a connector between the new titanium synthetic root and the prosthetic tooth. The abutment is removable in case it ever needs to be replaced or adjusted. The Crown – This restoration acts as your new tooth. Typically, a crown is made from PFM or zirconium for durability and aesthetically pleasing results. Our team at The Dental Office At River House will conduct a medical history and full examination to confirm you are healthy enough to receive a dental implant. During our examination, we will order x-rays and impressions of your jaw and teeth to determine the amount of bone, gum tissue and available space for the implant. Patients can expect up-to six-months from start to finish for a dental implant procedure to be completed. Over the six-month process, your jaw and gums will need time to heal to enable a process called osseointegration, which is a natural healing process that takes place after the titanium post has been surgically implanted into your jaw. Our professional staff at The Dental Office At River House are happy to assist you with any questions you may have regarding dental implants and the approval procedure. Please contact us for more information by visiting our Arlington, Virginia, location.